I know I left you guys with some scary process shots last time, so hopefully this will help. That's a terrible night photo, but I was too excited to wait for better light. Plus we were on a deadline - but more on that in a sec. 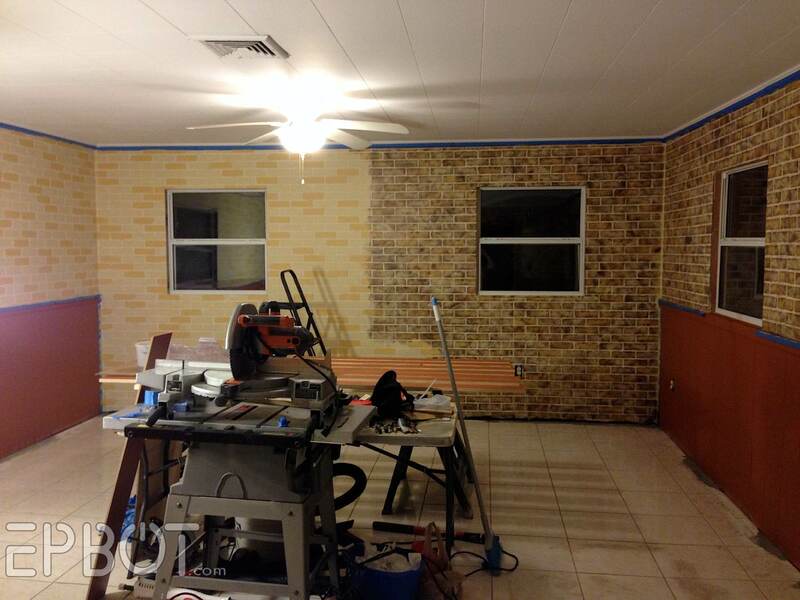 So we fauxed the brick paneling to look like - surprise! - bricks, albeit lighter and more golden-toned ones. 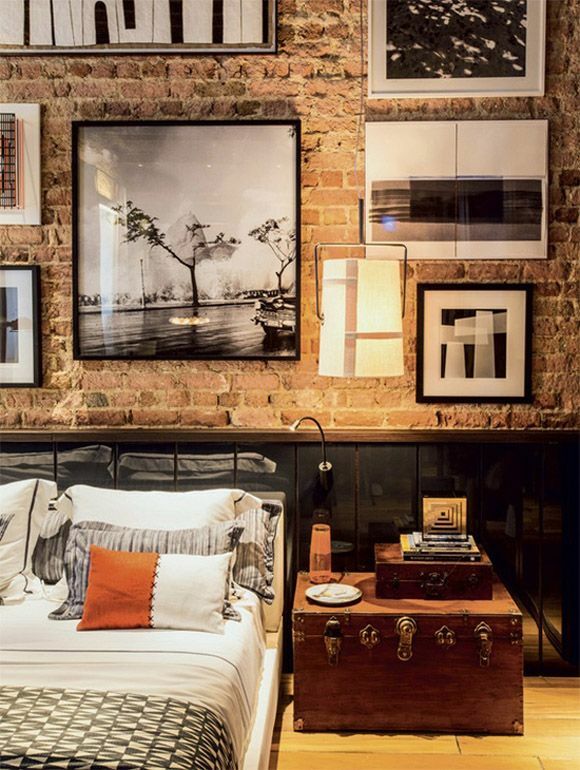 This brick finish isn't nearly as time-consuming as you might think: about a day's work. It's also surprisingly easy. Maybe I'll post a quick tutorial later, if you guys are curious? All of the trim except the crown is also faux finished to look like dark wood. We initially planned to faux the paneling, too - ergo that ugly orange from The Simpson's pic - but had so many problems with our paneling and glazes that we eventually gave up and just painted it flat black instead. The black is now our favorite part, so chalk that up to a happy accident! Those white doors are going to be painted black; just haven't gotten to 'em yet. (And the little white patch near the floor has already been touched up.) I replaced all the old wall plugs, so now the ones on the paneling completely disappear. We've already loaded most of the furniture back in to the room, because remember that deadline I mentioned? Well, by the time most of you read this John will be in the hospital having inner ear surgery (!! ), and his recovery requires that he not lift anything heavier than 20 pounds for a few weeks. (?!) That little wrinkle had John sprinting for the finish line on this project, so we've been putting in a lot of long hours. Thanks again for your patience while I took this time out, guys. Please send happy thoughts and good juju for John's recovery, since we're hoping he won't have to deal with any dizziness or complications afterward - and, of course, that the surgery actually restores his hearing to 100%! The room is looking great! Here's to a quick recovery for John. Fabulous and hugs to John for a speedy recovery. The walls are so gorgeous!!! I can't wait to see how the room comes along! Hope John's surgery and recovery go well! That looks amazing! Oh my word! I'm so excited to see further progress and yes please on the faux tutorial. Good wishes for John and the amazing gift of renewed hearing. Wishing John a successful surgery and speedy recovery too! Beautiful room! Sending good ju-ju vibes for complete healing (and hearing) for John from over Tampa way. Good wishes to you both. John deserves only the best. Stunning room. You guys are very talented. Sending prayers and best wishes to John for a quick recovery! I love all your updates and your tutorials are the best; so please send more :) Prayers for John's surgery. May it go well with an easy recovery. The room looks awesome! What a great transformation! 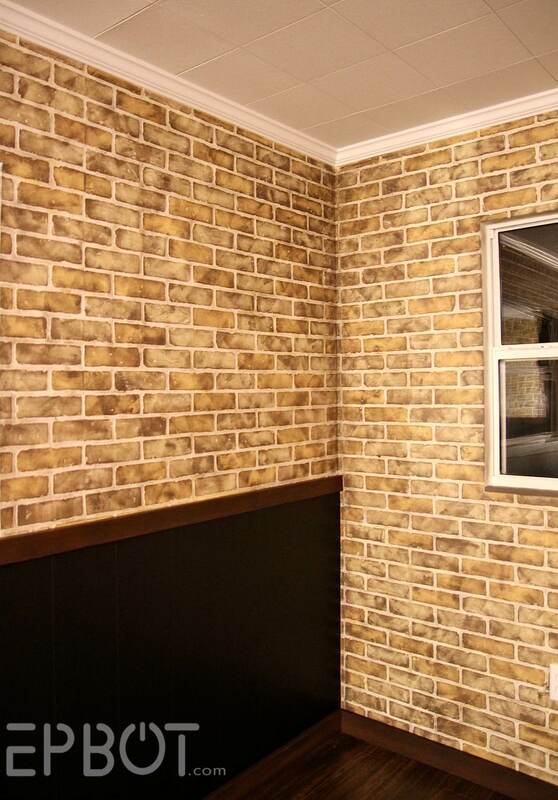 And yes, I'm very curious about the faux brick finish magic. Best wishes for a safe surgery and rapid recovery for John. Can't wait to see the final pieces come together. 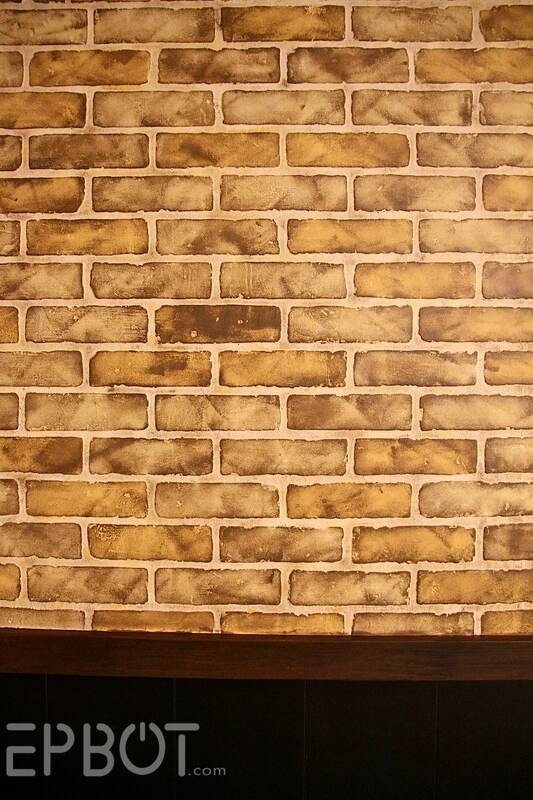 I'd love the faux brick tutorial, someone painted my fireplace a flat cream and it's not pretty. PrAyers for a successful Surgery and quick healing for John. It's crazy how large the room looks now! Wow, what a transformation! You two did a great job on the room. Praying that John's surgery goes well and is successful. Beautiful! After the progress pics, I knew you had something phenomenal in mind, but I couldn't figure out what it was - you did not disappoint! 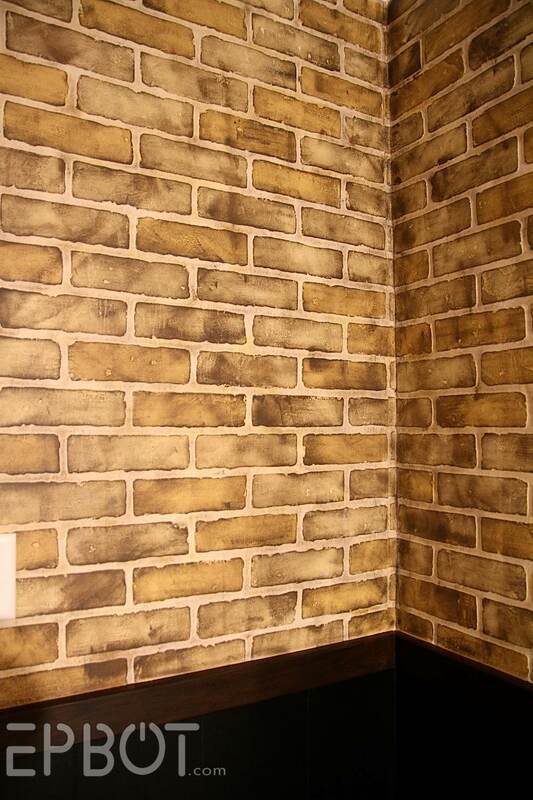 I would definitely be interested in the tutorial for the faux finish on the brick. Also, I don't know if they'll be covered, but if not, I think some vintage wall outlet covers would be great for those ones on the all-brick wall! Sending good vibes your way for John's surgery, and thanks for such an awesome blog! Best of luck to John on his surgery. I love the room so far. Sending prayers and good ju-ju for John! Also. This room. Gorgeous already! Wow that looks epic. You never cease to amaze me :o. Good Thoughts and Juju for Johns surgery!! Lots of quick-healing, full-recovering, awesome-hearing vibes are flying your way, John!! The room is so stinkin' fantastic, I can hardly take it! 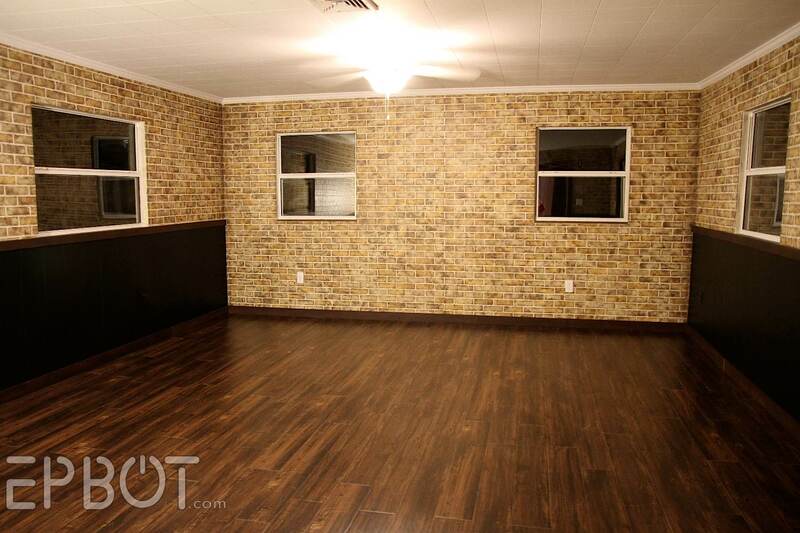 I love the brick transformation, and the floors are beautiful! I can't wait to see it when it's complete. Looks amazing! Can't believe the difference the final paint job on the faux bricks makes. Best of luck with the upcoming surgery! All my best to John for his surgery and peaceful thoughts to you as well. (HUGS) Your room looks FAB!!! My husband and I have been contemplating putting wood down in our living room. Yours looks fantastic, what did you use? Also, I'm glad to hear about John's hearing. That's amazing! Best wishes for a successful surgery and an easy recovery for John. Good luck to John with his surgery and recovery! The room looks great, I think you should consider writing a book on how to geekify your house with all your how to and makeover projects. Looks awesome, guys! 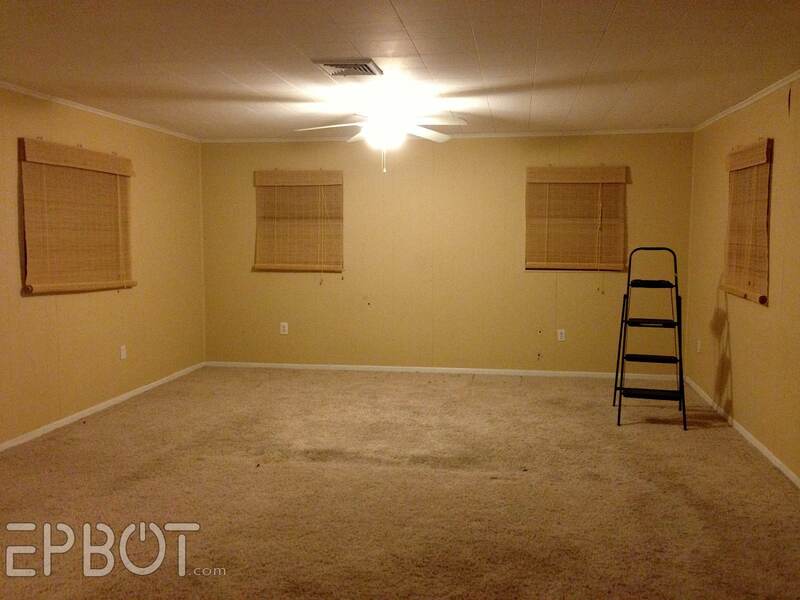 I'm sure the completed room will be swoonworthy. Good luck, John and Jen, I'll be thinking good thoughts and hoping good hopes for you! Looks great, a good start! Hoping for no complications, quick recovery, and best results for John. Hugs and good thoughts to John! Good luck! 1) Sending lots of good thoughts for a speedy recovery Johns way! 2) Holy cow -that room is FANTASTIC - I am always so amazed at your creativity. This is gorgeous! Hope all has gone well with John's surgery! Wishing him a pain-free and quick recovery and a whole new world of stereo hearing. I'm just absolutely stunned by how awesome that brick-work looks and would LOVE a tutorial. I have so many questions, none of which need to be answered here if you're already planning to answer them in a tutorial. 1. 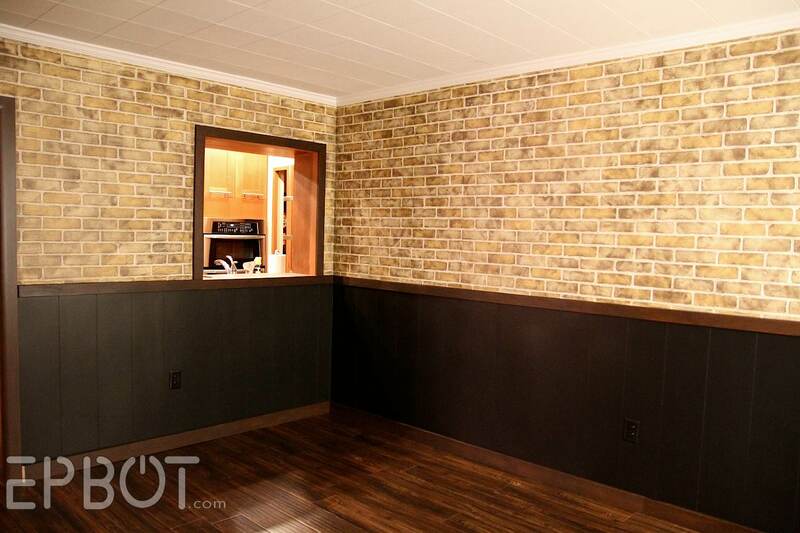 How did you make the seams in the brick paneling disappear? 2. What brand of primer did you use? What brand of paint and what colors? 3. 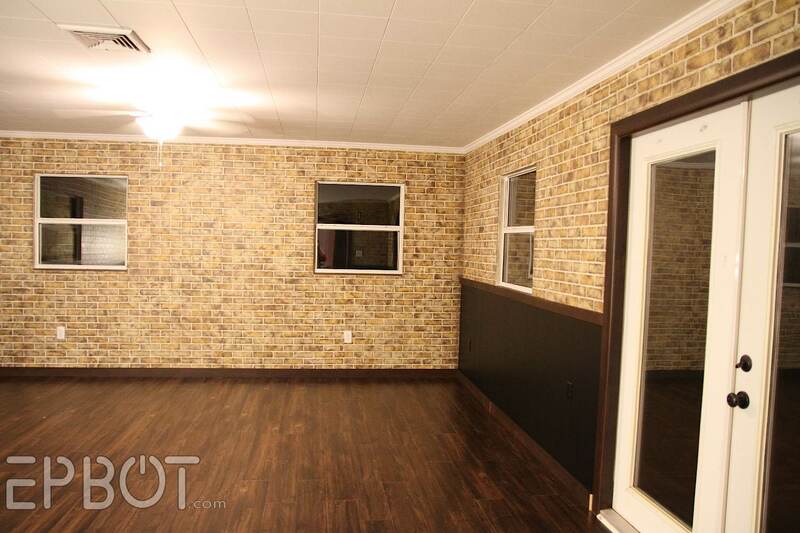 Why did you decide against continuing the wainscoting all the way around the room? Is there eventually going to be a whole wall built-in unit on that back wall? 4. What brand and finish is that gorgeous flooring? As always, I am amazed by the ideas you and John come up with and the flawless execution. You guys are true masters of everything crafty and cool! I cannot wait to see the finished room with the sconces, cornices, and entertainment center. Your projects are so incredibly inspirational. Also, I didn't realize you had a window from the kitchen into that back room. I don't think you've ever shown us that wall before, or if you have, I just overlooked that. Pretty neat! Thanks for your willingness to share your home and life with us. All the best to both of you as John recovers from his surgery. I'm keeping you two in my thoughts! Wow! I cannot believe how good it looks! I have to admit, you really had me worried with the brick stuff--but after the paint it looks great! I would be interested to see how you did it (and hooray for fake wood floors! I love mine). Best wishes for John and you during the recovery. Dang, girl, that looks fabulous! I love it! I am always amazed at the talent and creativity that seems to just ooze out of you two. Wow, just gorgeous. I'm excited to see more, after John is recovered of course! Prayers and best wishes for a quick recovery and a successful hearing restoration! That looks completely amazing! You guys are so talented, seriously. Best of luck to John on his surgery! Hoping everything goes great with John's surgery! I am partial to the rotating fan made up of smaller fans, but there is so much awesome work ranging from historic Victorian to leviathan ironwork. YES to the tutorial!!!! Please and thank you!! And sincere good wishes for John to have a good recovery and his hearing to be fully restored! Sending happy and positive thoughts your way. The room is incredible! 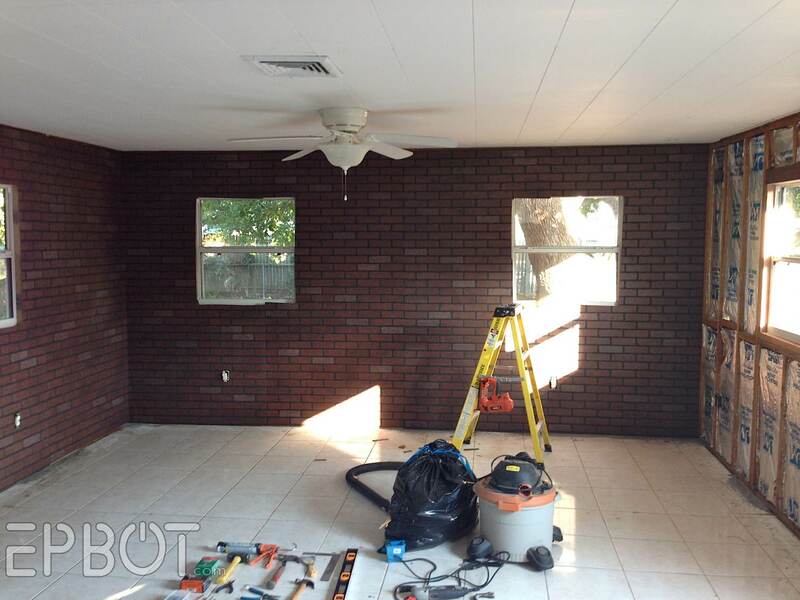 The brick changes, the floors, just wow! You are both so talented. Good luck and best wishes to John on his surgery, recovery, and hearing! Can't wait to see the room with all of its steampunked features! It's definitely improving as you go! Remember me? I'm the idiot who was a little 'skeered.' Now I'm a lot humbled. This is beyond awesomesauce! Oh man. You are my idols. I have a stupid brick fireplace that I've been meaning to do for years - paint is purchased, pins have been read, days have been wide open - but I'm too chicken to start. No more! Please, please post how you did the fauxing. It's bloody brilliant! Oh, snap. In my excitement to show how excited I was, I missed the last part of your post. Best wishes to your other half - hope he gets well quickly & enjoys his pain meds. Best wishes to John for an easy and speedy recovery! Safe surgery and speedy recovery to the wonderful John, and mad hugs (if you are comfortable with them) to you:- there is no way on Earth that you should consider yourself terrible at visualising things. This entire site is a testament to your vision and creativity. You two are an inspiration! The room looks wonderful and I can't wait to see the next installment of pictures! In the meantime, hope John's ear surgery goes well and that you both get to enjoy the time while he recovers! I try to stay off facebook because it makes me mad, but I just checked solely because you hadn't updated us here. Glad John's doing well, and seems to have had success! All the best! Another success for team Jen and John :) Best of luck to John for a speedy recovery and 100% hearing! This is amazing. I can not wait until the final photos!! OH, Jen! So awesome. Best wishes to John and his successful surgery! It looks fabulous. What a transformation! Sending good thoughts John's way, hoping the recovery is quick, painless and brings back his hearing 100%! Looks great! Your last post was scaring me a bit, but it looks amazing! I've been sending directed good thoughts to John, and will continue to until he's recovered, hopefully with hearing back. My brother had a cochlear implant last year. It has greatly improved his hearing and his quality of life. Good luck to John!